All transactions are safe and secure with a reliable history in online purchasing behind each of our associates. 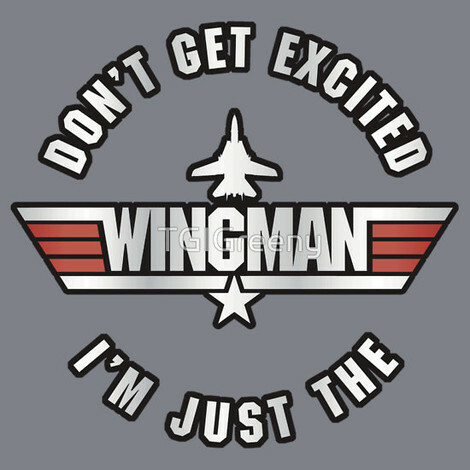 Buy the Wingman t-shirts to own Top Gun clothing and merchandise. The front of this navy Top Gun Wingman t-shirt contains a nice looking yellow wings style logo. At the end of the movie, Maverick shows that he has learned the important lesson of being a good wingman by covering Iceman and at the same time downing several MiGs. Earlier in the movie, Goose is Maverick's wingman in the bar when Mav sings "You've Lost that Lovin' Feelin'" to Charlie. These Wingman Top Gun t-shirts express your loyalty. In addition to the Wingman tees above, browse the Top Gun Clothing Gallery for more apparel like men's and women's clothes, kids shirts or hoodies.